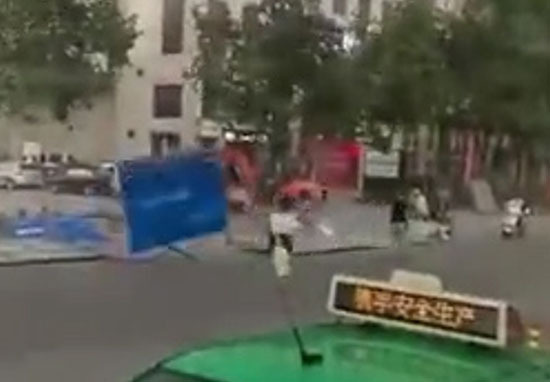 A woman in China narrowly avoided a beheading when a metal fence panel flew across the road and knocked her to the ground. Mobile phone footage caught the moment the woman narrowly escaped having the top of her head cut off as strong winds sent the fencing panel slicing through the air. 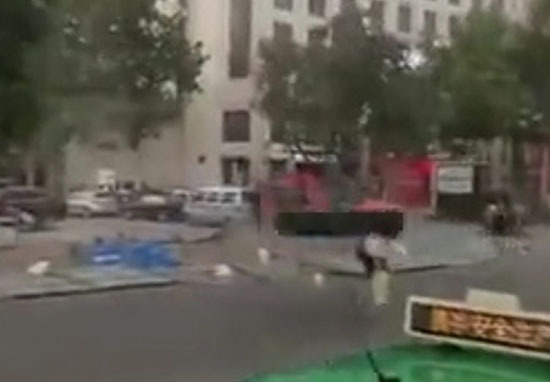 The video was taken as high winds hit Baoji city, in north-west China’s Shaanxi Province. In the video, a dark-haired woman dressed in a black skirt and light-coloured top can be seen crossing the road. As she gets halfway across, a blue metal sheet that formed part of a nearby blown down fence is lifted by a strong gust of wind into the air. The heavy metal panel is flipped over and carried several yards by the blustery weather, before falling and hitting the woman, scything across the top of her head. The unidentified woman was sent flying under the force of the metal panel, and can been seen stumbling forward as the sheeting is carried out of shot. It was reported that a number of eyewitnesses rushed to help the woman as she lay in the middle of the road. They remained with her as she recovered from her close encounter. Fortunately it was reported she was not seriously injured in the incident. A girl in America had her own head-related incident over the weekend, as she got her head stuck in an exhaust pipe while at a country music festival, having to be cut free by a fire crew. How much alcohol does it take to get your head stuck in a diesel pickups exhaust tip?Who knows this girl? I have got to hear her side of the story. 19-year-old Kaitlyn Strom decided to try and see if she could fit her head in a truck’s oversized exhaust pipe, and consequently got stuck there for 45 minutes while she awaited help. Speaking to Hutchinson Leader, Strom explained why she decided to put her head in an exhaust pipe. We were just all having fun and I saw this big exhaust pipe and I was like, ‘Hey, my head could probably fit in that’. So I tried it. It did fit, but it didn’t want to come back out. The fire crew arrived and cut Kaitlyn free from the exhaust with an electric saw. She had a medical check up, and remained unscathed from her investigation into the truck’s mechanics. I remember getting my head unstuck, and I just looked at him and apologized, and he said, ‘No, I’m just glad you’re OK. Don’t worry about it’. He’s already fixed his exhaust and is going to be working on that. I did not have to pay for anything like that, because he was absolutely wonderful.